Waldorf salad dates back to the late 19th century and was named for New York's Waldorf-Astoria Hotel where it was created. For this version, I wanted to update the dish to be both lighter and more satisfying as an entrée. I made a couple of key substitutions. First, I swapped out the walnuts for pecans, toasted to bring out their flavor. And I replaced the mayonnaise with walnut oil, which when mixed with balsamic vinegar and mustard sort of tastes like mayo oddly. With sauteed chicken, this makes a satisfying salad dinner. 1. Heat olive oil over medium heat in a 10-inch stainless steel frying pan. Combine flour, seasoned salt and pepper on a small plate. Pat chicken dry with paper towels and dredge in flour mixture. Add to pan when the oil is hot (chicken should sizzle). Saute chicken until browned on both sides, about 5 minutes per side. Set aside to cool. Once cooled, cut into 1/2-inch pieces. 2. Heat a small (8-inch) frying pan over medium-low heat. Add pecans to pan and heat, tossing occasionally until lightly browned and fragrant (be careful not to burn). Set aside to cool. 3. Whisk together walnut oil, balsamic vinegar, mustard and salt and pepper (to taste) until well combined as a vinaigrette (I use a 1-cup Pyrex glass measuring cup and about 70 strokes with a fork). 4. Cut leaves off celery stalks, chop leaves and set aside as a garnish. Remove any bad parts of the celery, and chop stalks to 1/4-inch pieces. 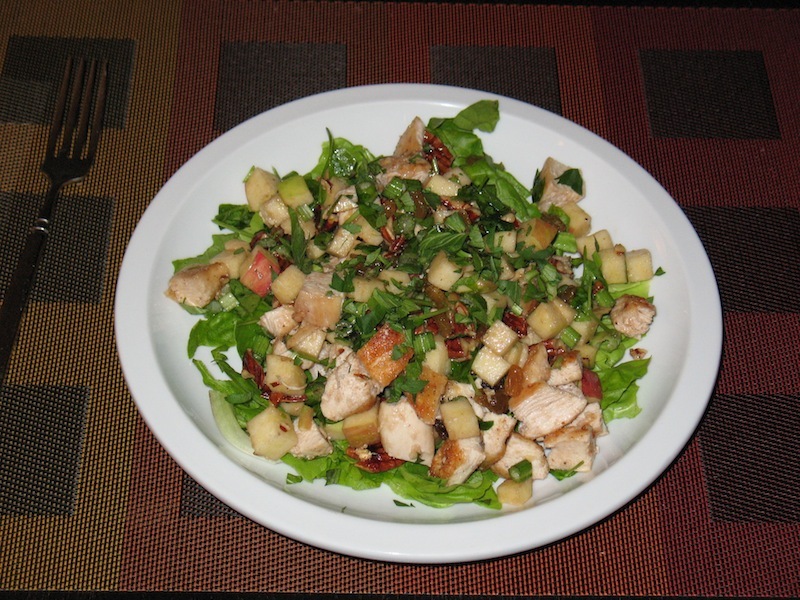 In a large salad bowl, combine chopped celery stalks, cubed apple, salad greens, raisins, chicken and pecans. Toss with vinaigrette. Serve on plates topped with chopped celery leaves. Ha! That would be great. Although I'm probably not the first person to do a new spin on the Waldorf and call it "Astoria."